Vice-Chancellor of Khulna University of Engineering & Technology (KUET), Prof. Dr. Quazi Sazzad Hossain placed floral wreaths on Mausoleum of Father of the Nation Bangabandhu Sheikh Mujibur Rahman at Tungipara on 16 August, 2018. Special prayer was also held to seeking eternal peace for Bangabandhu and other martyrs of August 15, 1975. Former Vice-Chancellor of KUET, Prof. Dr. Muhammed Alamgir; Former President of Teachers’ Association of KUET, Prof. Dr. Shibendra Shekher Sikder; President of Teachers’ Association & Director (Students’ Welfare), Prof. Dr. Sobahan Mia; Head of URP Department, Prof. Dr. Md. Mustafa Sarwar; Head of IEM Department, Dr. Azizur Rahman; Vice-President of Teachers’ Association, Prof. Dr. Pintu Chandra Shill; Director (Planning & Development), Prof. Dr. Kazi A B M Mohiuddin; Deputy Director (Students’ Welfare), Dr. Sajal Kumar Adhikary; General Secretary of Teachers’ Association, Md. Ikramul Hoque; Registrar G M Shahidul Alam; President of KUET Chhatra League, Md. Abul Hasan Shovon and other teachers, officers, students, staffs of KUET were present there. KUET rolled out a red carpet after KUET Vice-Chancellor Prof. Dr. Muhammed Alamgir leave the Vice-Chancellor office room at his last working day as a Vice-Chancellor on 02 august at 5 pm. KUET Students & Officials Standing in alignment with two sides scatter petals of flowers upon the Vice-Chancellor with clapping when he left the Vice-Chancellor Office. Expressing gratitude to the President, the Prime Minister, the Education Minister, University Grants Commission of Bangladesh (UGC) Professor Dr. Muhammed Alamgir said, “I tried my best to take this University the leadership in promoting technological developments and management of the nation by strengthening engineering, science & technological education and research. Now KUET has been at the forefront of education, research and nation-building, producing the best graduates in the country. As the Vice-Chancellor of KUET, I am honored to be at the helm of what is considered as one of the foremost universities in Bangladesh and I hope to lead through an outstanding period of progress and growth in quality education, research and overall teaching & learning environment of the campus. He also thanked to all the faculty members, Officials, Staffs, Students of KUET for cooperation him during the last eight years when he was being as the VC of this University. And now all together we made KUET as a Brand Name in Higher Education. On July 21, 2010, Prof. Dr. Muhammed Alamgir was appointed as the Vice-chancellor of KUET by the Honorable President of the People’s Republic of Bangladesh and also the Chancellor of this University. After successfully completion of his four years duration as the Vice-Chancellor he was re-appointed 2nd term as the Vice-chancellor of KUET on 03 August 2014. KUET Vice-Chancellor Prof. Dr. Muhammed Alamgir call to the students “When you have a dream in front of you, you will succeed. The dreams never die” in the event of a Discussion on "My Dreamed KUET: How close it is". Participation with the students, this event held on 02 August at 5:30 PM at the Student Welfare Centre at KUET. Vice-Chancellor of KUET Prof. Dr. Muhammed Alamgir was presided over the event. Director (Student Welfare) Prof. Dr. Sobahan Mia was represented the event. Head of Uraban and Regional Planning Department Prof. Dr. Md. Mustafa Saroar, Deputy Director (Student Welfare) Dr. Sajal Kumar Adhikary, Assistant Director (Student Welfare) Shahrear Roman, President of Bangladesh Chhatra League, KUET Branch Md. Abul Hasan Shovon, General Secretary Sadman Nahiyan Sezan and Students from various departments were delivered speech in the event. 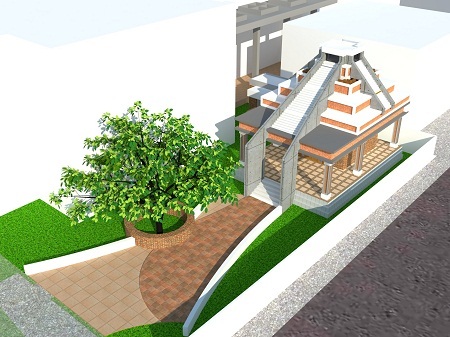 Construction work of a Temple have been inaugurated besides the Student Welfare Centre of KUET. KUET Vice-Chancellor Prof. Dr. Muhammed Alamgir inaugurated the construction work of the Temple by setting up the foundation stone on 02 August, 2018 around 4:00 pm. Addressing the inaugural ceremony, KUET Vice-Chancellor Prof. Dr. Muhammed Alamgir said that Bangladesh is a non-communal country. KUET authority trying to provide as much facilities as they can to the students of the university to improve their academic and extracurricular activities. Emphasizing upholding the tradition of the university, he also urged the students to play a greater role in building a developed country promoting the spirit of the Liberation War and free thinking. Among others, Dean of ME Faculty Prof. Dr. Mihir Ranjan Halder, Director of IICT Prof. Dr. Bashudeb Chandra Ghosh, Director (Student Welfare) Prof. Dr. Sobahan Mia, Vice-Chancellor of North Western University Prof. Dr. Tarapada Bhowmick, Designer of Temple and Lecturer of BECM Department Md. Shahriar Hossain and Superintendent Engineer Dr. Julfikar Hossain spoke at the inaugural ceremony. The Inauguration Ceremony of “Bangabandhu Square” of Khulna University of Engineering & Technology (KUET) was held on 02 August 2018 at 9 pm in front of Auditorium building in campus. Vice Chancellor of KUET Prof. Dr. Muhammed Alamgir, as the chief guest, unveiled the stone board and inaugurated it. In a short speech he said, the academic activities of this university was started on the 1974 after receiving special direction from Father of the Nation Bangabandhu Sheikh Mujibur Rahman. KUET pays royal tribute to him with the establishment of “Bangabandhu Square”. He also thanked Engineering Section, Planning & Development section, Architect and all concerned related to this project. 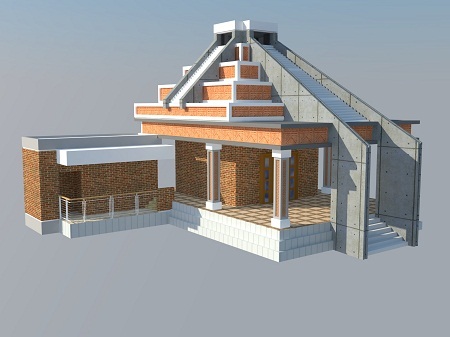 Architecture of “Bangabandhu Square” Assistant Professor of Khulna University MD. Sheikh Sadi Bhuyan was briefed about its construction style. Dean of the Faculties, Directors, Heads of the Departments, Section Heads, Teachers, Students, Officers, Staff of KUET were present in the occasion. With the participation of all faculty members of KUET a Session about "KUET at what heights would you like to see" held at KUET on 01 August, 2018 at 9:00 AM at Student Welfare Center. KUET VC Prof. Dr. Muhammed Alamgir was presided over the event. He said, University standards depends on its faculty members merits and researches. A teacher as like a house of light of knowledge for the students. KUET is now pioneer in higher education and researches. In future, KUET will be International Standard University by the leadership of KUET faculty members. Prof. Dr. Quazi Hamidul Bari, Dean, Faculty of Civil Engineering, Prof. Dr. Md. Abdur Rafiq, Dean, Faculty of Electrical and Electronic Engineering, Prof. Dr. Mihir Ranjan Halder, Dean, Faculty of Mechanical Engineering, Prof. Dr. Sobahan Mia, Director (Student Welfare) were delivered speech in the event. The Session was designed as the Presentation by the Resource Persons, Group Works, Presentation by Each Group, Open remarks by the participants, Presentation by the Specialists. In the session 10 Resource Person- Prof. Dr. K. M. Azharul Hasan of CSE Department, Prof. Dr. Md. Shahjahan of EEE Department, Prof. Dr. Mohammad Ariful Islam of ME Department, Prof. Dr. A B M Aowlad Hossain of ECE Department, Dr. Azizur Rahman of IEM Department, Md. Esraz-Ul-Zannat of URP Departmen, Md. Alamgrir Hossain of Physics Department, Md. Khalekuzzaman of CE Department, Dr. Nasrin Akhter of BME Department, Abu-Hena Mostofa Kamal of Humanities Department describes their presentation with using the multimedia system. Prof. Dr. Bashudeb Chandra Ghosh of EEE Department, Prof. Dr. Md. Kutub Uddin of ME Department, Prof. Dr. A. N. M. Mizanur Rahman of ME Department, Prof. Dr. M. M. A Hashem of CSE Department, Prof. Dr. Md. Md. Rafiqul Islam (1) of EEE Department, Prof. Dr. Mustafa Saroar of URP Department, Prof. Dr. Kazi ABM Mohiuddin of CE Department were made joint recommendations in the session. At the end of the session “KUET Information Booklet” was unwrap and distributed to the faculty members by the KUET VC Prof. Dr. Muhammed Alamgir. Discussion on "The university wants to see the height we dreams in 2030" held at KUET on 01 August at 12:30 PM at Seminr room of KUET. KUET VC Prof. Dr. Muhammed Alamgir was presided over the event. Registrar of the University G. M. Shahidul Alam, Additional Comptroller Md. Monirul Haque Khan, Controller Md. Toyebur Rahman, Linrarian Md. Akkas Uddin Pathan, Chief Engineer A. B. M. Mamunur Rashid, Secretary of Officers Association Md. Mahmudul Hasan, Executive Engineer Hossain Mohammad Arshad, Assistant Director (Physical) Md. Helal were delivered speech in the event. Public Relations Officer Monoj Kumar Majumder represented the program. Officers of KUET attend in this program. Discussion on "Our role to take KUET at height we dream about" held at KUET on 30 July at 1:00 PM at Guest House. KUET VC Prof. Dr. Muhammed Alamgir was presided over the event. He said, There is no scope to reduce the role of any person in the organization. KUET Vice-Chancellor thanked everyone for the last eight years for cooperation. Registrar of the University G. M. Shahidul Alam was present there. Public Relations Officer Monoj Kumar Majumder represented the program. President of Kormochary Somity (3rd Class) Md. Mamunur Rashid Juel, Surujjaman Hanif, Md. Imrul Islam, Abul Kamal, secretary of Kormochary Somity (4th Class) Md. Imran Ali, Asad Morol, Ahasan Habib Sumon were delivered speech in the event. 3rd Class and 4th Class Staff of KUET attend in this program. Discussion on "Leadership for 2041: How to prepare myself" held at Khulna University of Engineering & Technology (KUET). With the participation of the student organizations of this university the program was held on 29 July at 5:30 PM at the University conference room. Vice-Chancellor of KUET Prof. Dr. Muhammed Alamgir was present as Chief Guest at the program. Founder of Center for Developing Management Excellence SAM Sawkat Hossain was present as the speaker and Director (Student Welfare) Prof. Dr. Sobahan Mia was presided over the event. Training on "Quality Assurance in Engineering Education through OBE" held on 27th July 2018 at the Conference Room, KUET, Khulna. At 09:00 AM in the inauguration ceremony Dean of Mechanical Engineering Faculty Prof. Dr. Mihir Ranjan Halder was present as the chief guest of the event. Prof. Dr. M. Rafiqul Islam, Director, IQAC, BUET was present as the distinguished resource person. Prof. Dr. Quazi Sazzad Hossain, Director, IQAC, KUET was presided over the programme. Welcome speech delivered by the Prof. Dr. K. M. Azharul Hasan, Additional Director, IQAC, KUET. Training on “Quality Assurance in Engineering Education through OBE” held on 26th July 2018 at the Conference Room, KUET, Khulna. At 09:00 AM in the inauguration ceremony Vice-Chancellor of KUET Prof. Dr. Muhammed Alamgir was present as the chief guest of the event. Prof. Dr. M. Rafiqul Islam, Director, IQAC, BUET was present as the distinguished resource person. Prof. Dr. Quazi Sazzad Hossain, Director, IQAC, KUET was presided over the programme. Welcome speech delivered by the Prof. Dr. K. M. Azharul Hasan, Additional Director, IQAC, KUET. Workshop on Solar PV Panel held at KUET on 23 July 2018 at the Distance Learning Centre, organized by the office of the Director (Planning & Development) of this University. Vice-Chancellor of KUET Prof. Dr. Muhammed Alamgir was delivered his speech as the Chief Guest. The opening remarks was done by the Director (P&D) Prof. Dr. Kazi ABM Mohiuddin. The technical session Solar Energy: ‘Context and Design’ and ‘Implementation of Solar PV Panel’ conducted by the Engr. Ahmed Tawfeeq Husain, MEng, Consultant. Teachers and Officers of KUET were participated in the workshop. RFID Based Library Management System and National Workshop on IR and RFID Implementation of Central Library, KUET” organized by Library System Automation of KUET (CPSF-435) of Central Library and funded by Higher Education Quality Enhancement Project (HEQEP) under University Grants Commission (UGC) of Bangladesh held at KUET. Inauguration ceremony of this workshop was held on 21 July 2018 at 09.00 AM at Digital Library Access Center, Central Library, KUET. Vice-Chancellor of KUET Prof. Dr. Muhammed Alamgir was present in the Inauguration of RFID Based Library Management System and National Workshop on IR and RFID Implementation of Central Library, KUET as Chief Guest. Prof. Dr. Quazi Hamidul Bari, Dean, Faculty of Civil Engineering, Prof. Dr. Md. Abdur Rafiq, Dean, Faculty of Electrical and Electronic Engineering, Prof. Dr. Mihir Ranjan Halder, Dean, Faculty of Mechanical Engineering and Dr. K.M. Azharul Hasan, Professor, Department of Computer Science and Engineering was present as Special Guests. Md. Akkas Uddin Pathan, Sub-Project Manager (CPSF-435), HEQEP & Librarian, Central Library, KUET was Presided over the event. 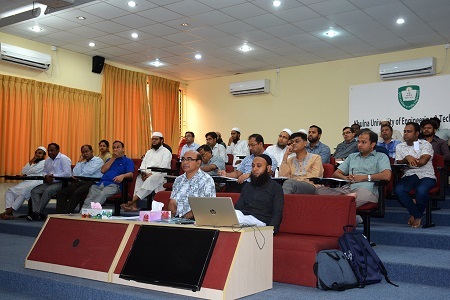 8 research person and 33 Library & Information Technology officer from 16 public and private universities of Bangladesh were attended in this workshop. Workshop on Research Integrity and Publication Ethics organazid by Institutional Quality Assurance Cell (IQAC) of KUET held on 14 July, 2018. In the inaugural session Vice-Chancellor of KUET Prof. Dr. Muhammed Alamgir was present as the Chief Guest while Director of IQAC of KUET Prof. Dr. Quazi Sazzad Hossain presided over the function. Prof. Dr. K. M. Azharul Hasan, Additional Director of IQAC was delivered welcome speech and anchoring the session. Dr. Mohammad Ariful Islam, Department of Mechanical Engineering, Dr. Kazi A. B. M. Mohiuddin, Depatrment of Civil Engineering, Dr. Md. Shahjahan, Department of Electrical and Electrical Engineering were present as the resource person in technical session. Postgraduate students of CE, EEE, ME,CSE and IDM of KUET were took part in the workshop. A Courtesy meeting was held between the delegates from USAID Grantee and KUET VC on on 11 July, 2018. The delegates met the Vice-Chancellor of KUET Prof. Dr. Muhammed Alamgir in his office at 10 am. The team comprises Country Director, Bangladesh, USAID Grantee Engr. Maksudur Rahman and Senior Program Officer Abu Saleh Muhammad Saifullah. Head of URP Department Prof. Dr. Md. Mustafa Saroar, Director (P & D) Prof. Dr. Kazi A. B. M. Mohiuddin were present in the meeting. Tree Plantation Week observed at Khulna University of Engineering and Technology (KUET) campus on 11 July, 2018. Tree Development Committee of KUET organized this program as a part of the government’s country-wide tree plantation programme and will turn it into a social movement. Vice-chancellor of KUET Prof. Dr. Muhammed Alamgir was present in the inaugural ceremony as Chief Guest and formally opened the function at around 11 am in font of administrative building. To mark the day a colorful procession was brought out from the administrative building that paraded all the campus led by the Vice-Chancellor. Later, Vice-Chancellor planted a tree in campus. Deans, Institute directors, heads, directors, teachers, students, officers, staffs were present in the program. President of Tree Development Committee of KUET, also the librarian Mr. Md. Akkas Uddin Pathan presided over the function. Vice-chancellor Prof. Dr. Muhammed Alamgir in his inaugural speech called for planting more trees at homesteads, roadsides and other open spaces during the monsoon to protect environment from the impact of climate change. Terming trees as an inseparable part of life and livelihood and also the best friends of the people.